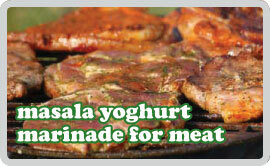 This is one of the tastiest of Indian marinades. It’s great with lamb and chicken. If you’re not lucky enough to have a Tandoor oven which, lets face it would be pretty pretentious if you did, you can grill or barbeque the meat for similar results. There are a few ingredients, but it’s really not that fiddly in reality and the taste makes up for it. Put all the masala ingredients into pestle & mortar or coffee grinder and grind to a fine powder. With a hand blender or in a pestle & mortar grind together the chillies, ginger, garlic and coriander to a paste. Stir in the masala powder, turmeric, cumin, vinegar and yoghurt. Heat the oil in a shallow pan and when medium hot, add the paste to the oil and stir for a couple of minutes – remove from the heat and cool. In a thick plastic bag or large bowl, coat whatever meat you’re using with the marinade and seal/cover. Leave in the fridge for at least 4 hours or overnight. When you’re ready to use sprinkle over some salt and cook to your liking – drizzle over a little oil to keep everything tender and give a bit of crispening.